Hilton is celebrating its 100-year history with a new digital content series titled “Room 702,” according to news shared with Marketing Dive. It was inspired by the John Lennon and Yoko One Bed-In for Peace, a protest against the Vietnam War that started in Room 702 of the Hilton Amsterdam on March 25, 1969. The series spotlights stories of Hilton employees and how they embody the message of the Bed-In. One video features Serby Castro, a suite attendant at an Embassy Suites by Hilton in Orlando, Florida, who recycles leftover hotel soap and distributes it to regions lacking access to hygiene. Another video focuses on Ismaeil Dawod, a refugee who is involved in an apprenticeship program at the Hilton Frankfurt in Germany. The narrative focuses on his determination to start life over, including by learning a new language, as he helps other refugees. “Room 702” is being shared on Hilton’s social channels and is part of the marketer’s Travel with Purpose program focused on cutting its environmental footprint in half and doubling its investment in social impact initiatives by 2030. The series additionally showcases work by one of the photographers who captured the Bed-In, whose photos are on display at the Hilton Amsterdam for a commemorative exhibit in honor of the protest’s 50th anniversary. Sign up for the Mobile Marketer newsletter to get a daily digest of the latest developments in mobile marketing. Hilton is tapping into a politically charged moment from its past in order to support its current cause-driven marketing and a new digital content series that it’s pushing on social media. 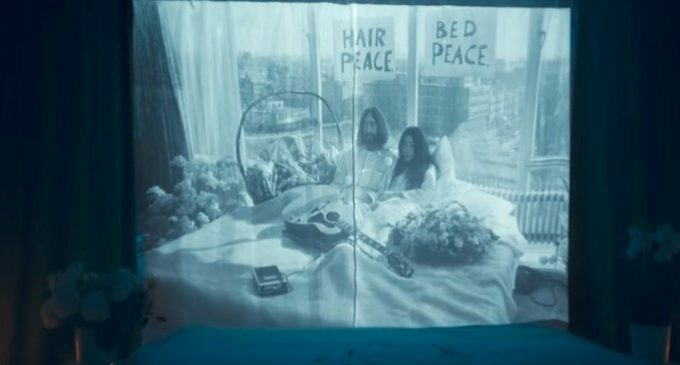 Lennon and Ono’s Bed-In for Peace lasted for two weeks across two hotels, one in Amsterdam and one in Montreal, and came during a time when public opinion against the Vietnam War was reaching an impassioned pitch. By referencing the iconic protest and the high-profile stars featured in it, the hotel chain could stoke a sense of nostalgia in consumers fond of Lennon and Oko’s work and drive interest to its videos spotlighting current employees. More marketers in the hospitality and travel category are tapping into bigger content marketing plays to differentiate their offerings from disruptor brands like Airbnb and to meet a consumer demand for digital video. Several of these efforts are centered on real-world employees and operations, with the goal of giving these businesses an air of authenticity. Hyatt two years ago ran a “World of Hyatt” campaign that had staff wear Snap Spectacles and record their perspectives as they went about their day, with the content then shared on the company’s social and digital channels.